I think if Time Travel was possible it has to have the Universe mapped out like a clock. You have to find out to go forward or backward in the timeline..... You ever think of something from memory from your childhood?Maybe something just random,something triggered you to remember even stuff that really was not that important,but you just remembered it. You also think how things will be in your future. You plan the future hoping to make that direct projection a hope to be reality. Some say the brain is more powerful than we use,that we only use about 10% percent of what we could be capable of doing.... I remember this nerdy kid growing up and this kid was like a genius,but his smarts was like Rain Man. He didn't even try hard in all classes and he was like 100s on all tests,but he was ultra weird..I remember he didn't even look interested when the teacher was going over the teaching .The kid was strange.He would walk down the school hall and just spin for no reason or think he could walk through the walls.If the government ever wanted someone for expierments this was the kid. ThemDangMartians, SlammedZero and Runwildboys like this. Kinda went off on tangent there, didn't ya? timb2 and ThemDangMartians like this. If time travel were possible, you'd be screwed unless it included teleportation as well. Remember the Earth is 1) rotating, 2) revolving around the Sun, 3) The solar system is moving with the spiral arm around the galaxy, 4) The galaxy is moving..... So say you wanted to jump back 20 years.... you'd end up where the Earth is now, only 20 years ago and the Earth won't get to you for 20 years. Congrats. You're dead. timb2, ThemDangMartians, SlammedZero and 2 others like this. Compared to the math involved in going back to a certain moment in time, figuring out where seems like a piece of cake. Perhaps the speed necessary to get there would assist in the time travel itself? You bring up some good points. It wouldn't be purely time travel. Space and time are a group package. You have to account for both. You may not need teleportation as well, but at least some method to make up for the space that is traveled. DeathMonkey, Runwildboys and SlammedZero like this. My time machines calculates all that and puts me in the right place at the right time. I'm a skilled time machine builder though. So that's how that works. ThemDangMartians, DeathMonkey and Runwildboys like this. I definitely agree with you on that time is an illusion/perception. I watched an experiment where a person went into a room for 3 days with no stimulating activities or clocks. By the end of day one, he was already guessing the time to be 24 hours off of what the real time was. He was guessing ahead. By not having a way of measuring time, the illusion of time changed for him. Time does move in one direction, to the reality that we know. I always wondered what gave time the push in it's direction. I often think of the Big Bang. Maybe when the universe exploded and starting to expand (faster than the speed of light), that energy expanding outward is the wave of time and the reason for it's direction. When the universe eventually runs out of expanding energy (this is the rubber band theory) and snaps back, maybe that would turn around the direction of time. Obviously this is just a theory, but, part of the infinite possibilities to ponder. I pick up what he is putting down. Another fun way to think about it is outside observation. Let's just pretend that there is a planet with an intelligent species located 65 million light years away from Earth. If they had a technological capable telescope, and found the light of Earth, they would be merely seeing the dinosaurs still. Another crazy thing I heard was that Hitler was the first person to ever broadcast radio transmission into space. So, if intelligent life was out there listening, they could first come into interaction with a message from Hitler. That's a scary thought! Haha Though, there is a debate on if his radio-waves were powerful enough to make it very far. I also have always joked that what if an intelligent species picked up radio transmissions of something like Family Guy. Would they think that is what life on Earth is like? I've also thought about this. They could be robots or the way that humans in the future have evolved. Or, they could even be dimensional travelers. Possibilities are endless. Great chance aliens would be AI. Think about a robot. It is the perfect space traveler. No need for food, water, and your body is "timeless". Robotics still wear down by usage and time, but, you could just snap a new section on and carry on. I think the only concern might be energy. You would still need a way to produce energy. I suppose that would be your "food". Great points!!!! You would have to be very specific in your mathematical calculations on how and where to be in time travel. That also poses the question on how time travel would be. Would you travel through time to get to your destination or would time around you change? Still, I understand what you're saying. Even if I could change time around me, sitting in my computer chair, how do I know 50 years from now there isn't a 5 foot thick concrete wall built where I sit? ThemDangMartians, DeathMonkey and cowboyec like this. I definitely agree with you on that time is an illusion/perception. I watched an experiment where a person went into a room for 3 days with no stimulating activities or clocks. By the end of day one, he was already guessing the time to be 24 hours off of what the real time was. He was guessing ahead. By not having a way of measuring time, the illusion of time changed for him. Time does move in one direction, to the reality that we know. I always wondered what gave time the push in it's direction. I often think of the Big Bang. Maybe when the universe exploded and starting to expand (faster than the speed of light), that energy expanding outward is the direction of time. When the universe eventually runs out of expanding energy (this is the rubber band theory) and snaps back, maybe that would turn around the direction of time. Obviously this is just a theory, but, part of the infinite possibilities to ponder. I've got a theory that time is the inverse of energy. (sorta anyhow) Here is three case in points. Time on the face of the Earth (Earth being a massive object) Time moves slower than it does for GPS satellites in space. They are further from the Earth's mass and therefore time is moving slightly faster for them. We already know mass is energy by Einstien's E=MC². As noted before about a blackhole. A blackhole is the most massive objects in the universe. The closer to you get to that mass (ie energy) the slower time moves. Once you reach the blackhole's event horizon, time all but completely stops. 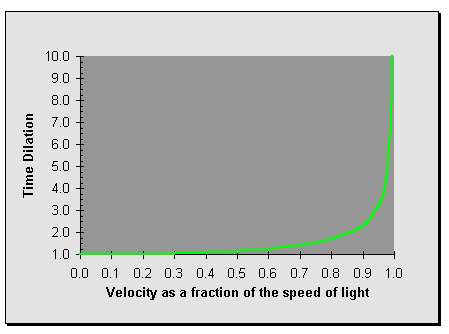 You cannot move faster than the speed of light. One of the main things behind that is to reach the speed of light requires an infinite amount of energy. Or to put it another way, an object's mass if it is traveling at the speed of light is infinite. At that mass / energy time would all but stop. If you were to go 90% of the speed of light, you would age half as fast as someone on Earth. (see time dilation chart below that graphs it) As you go above 90%, time dilation would increase quickly. Because time and mass / energy seem inversely tied at the hip is why I think time is basically the inverse of energy. Sort of anyway. Not completely. The time machine would have to be able to protect the traveler from outside forces. Similar to throwing a ball while sitting in a plane. The ball doesn't feel the effects of the plane traveling 500 mph. A time machine may have to be pretty stout to withstand the forces it will likely encounter. SlammedZero, timb2 and ThemDangMartians like this. Well Yeahhh!...You'd have to have excellent timing, and a great GPS system! SlammedZero, timb2, DeathMonkey and 1 other person like this. I love time dilation!! I thought the movie Interstellar did a great job of explaining it. How the first planet they arrive on, its proximity to a black hole causes an extreme time dilation, where one hour on the distant planet equals 7 years on Earth. It's crazy to think about all these fluctuations of time existing throughout the universe. I also enjoyed their take on four-dimensional space, or the tesseract, that Matthew McConaughey (Cooper) entered. Nice chart!! The faster we go, the more the time is affected. This always made me think about how light travels through space and time. Light takes about 8 minutes to reach Earth from the Sun. Is that because it is so fast or because it slows time around it? Take the comic book character The Flash for another example. Is he really just super fast? Or is he so fast that he just slows time around him, thus, allowing him time to make decisions and do the things that he does? I've thought about it for a short while...and if I indeed had a workable time machine and could actually go to any time I choose. And of course you can’t really go back in time. Do you truly believe that would change anything? And your family, being ultra rich, would have made you disappear without a trace when you were 5. I would definitely take precautions and make sure I had contingency plans in place. Besides, my family likes me. RGV_C_Los, Runwildboys and DeathMonkey like this.